Steadfast is book number 5 in the True North series by Sarina Bowen and at this point, she has me convinced that the Shipley Farm is a real place that I need to visit and invite myself to Thursday night dinner with the family. My heart broke for May in Steadfast (Book 3). She was going through a really difficult time in that book so I knew it was going to be emotional before I even read the synopsis. I also knew we would be diving deep into Mays journey into sobriety and the message of this book would be important and uplifting. Alec is such a fun character to balance out May. I worried that his spontaneous and carefree nature (not to mention him being a BAR owner) would be hazardous for May but their relationship ended up being so sweet and exciting that the hazards seemed to wash away with every chapter. The bar did play an integral part in this story but it wasn’t as bad as I thought it might be in the beginning. The love scenes are crazy hot in this book. The secrecy of their relationship and always wondering if and when they’re going to be caught together was exciting to read. May surprised me in how adventurous she could be and Alec surprised me in how tender he could be. Steadfast is a really good read. There was just something missing for me. Although I truly did enjoy this story, I didn’t find myself staying up all night reading because I couldn’t wait to see how it all ends. Every previous book in this series has been a stay up all night reading kind of book to me so that’s why I cannot give Steadfast 5 stars. If I was solely looking at this book by itself and didn’t factor in the way other books in the series made me feel, this book would more than likely be a 5 star read to me. So, that’s why I had to give Steadfast 4.5 out of 5 KBN stars. The message in this story IS important and uplifting. It changed my way of thinking about addiction and how hard it is for someone struggling with it to stay sober and live their life. 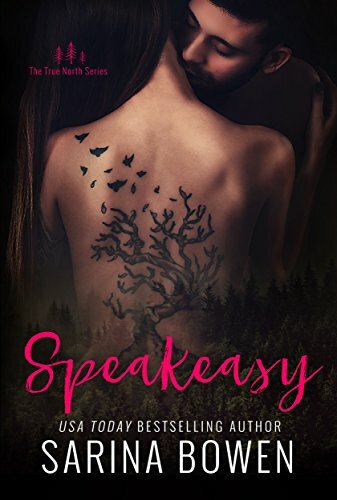 Add Speakeasy to your Goodreads TBR! This entry was posted in ~*~ New Release ~*~, ~*~Reviews~*~ and tagged in Addiction, Contemporary Romance, Love, new adult romance, Recovery, Romance, Sarina Bowen, True North Series.